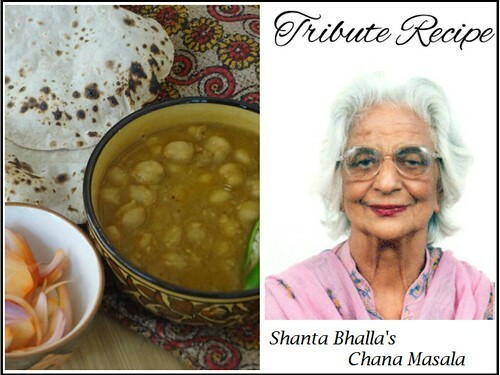 Radhika Mohan, our friend and freelance writer from Chennai, pays a tribute to her mother with her specialty dish – Punjabi Chana Masala, a side-dish with chick peas. She sent this recipe to Jigyasa and myself when we had hosted a blog event “Cooking for Kids with Love” at pedatha.com which is not operational any more. Most of the content from that site has been shifted here. My mom made the most delicious Chana Masala! She is no more, but her recipes linger not only in my mind and kitchen, but also in my daughter’s heart. It’s amazing, how a recipe can remind you of someone! The flavours and aromas arouse a longing to see her again. Needless to say, I can never eat or cook Chana Masala without reminiscing about my mom! I am delighted at making this recipe immortal by sharing it on this site with you all. “Naani” as my daughter called her, whipped up the most delicious chanas with ease. I don’t think the secret lay in the ingredients, but it was her love and passion to dish out something special for her kids and grandchildren, that made all the difference. She seasoned it with affection, tempered it with love and drizzled her warmth over all that she cooked! It’s amazing that a particular dish can bind generations as well as evoke emotions. To tweak this into a Jain recipe, avoid the ginger (and onions while serving). Roast the following ingredients together for 2 min with a pinch of salt. Grind in a mixie and keep aside. Cook the chana in a pressure cooker with 8 glasses of water. Strain and keep aside. Cook for approx 30 min, or till the chanas are tender. Heat oil in a wok and add chopped ginger, followed by the slit green chillies. Add one tbsp of the powdered masala and stir, so that the masala releases colour. Add coriander powder, red chilly powder and salt. Stir till well blended. Add remaining masala and cook for 7 to 10 minutes. If the chana appears too dry add some of the water which you used to boil the chana. The chana should ideally be moist and sticky. Decorate with onion rings and lemon wedges. Radhika Mohan’s quick wit and pleasant persona is seen in her writings. 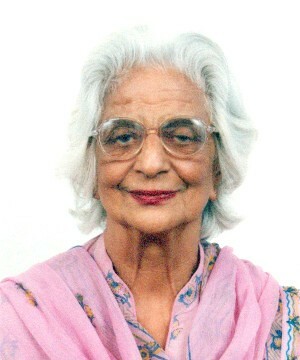 You can read some of her articles by clicking on Bai God, Swirls of Colour, A Whiff of Perfume? and Have a Green Mehndi! If reading this post reminds you of a loved one’s cooking or a special family recipe, share your thoughts with us by adding a comment below.